We are on the eve of the biggest Ford drag race of the year, the NMRA World Finals at Beech Bend Raceway in Bowling Green, Kentucky. The air should be cool and the times should be quick. Curious about how its Mustang would perform on the big stage, Watson Racing took its street/strip SEMA project out for some test hits. 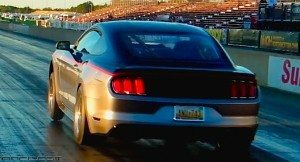 It turns out those three test runs were the quickest runs yet for a 2015+ Mustang still running an independent rear suspension. A Whipple 2.9-liter supercharger driven by a 10-rib belt boosts the Watson Coyote with about 18 pounds of boost, which creates well over 928 horsepower at the rear wheels. 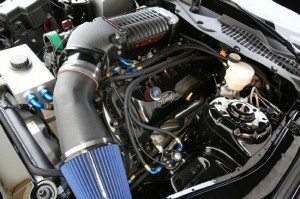 This 5.0-liter also wears Ford Performance Racing Parts camshafts and a full exhaust made up of American Racing Headers long-tubes, an American Racing Headers X-pipe, Pypes electronic exhaust cut-outs, and Magnaflow mufflers. The combo is backed by a Turbo 400 automatic trans and Watson Racing’s bolt-in 9-inch IRS. Chuck Watson Sr. and one of the company’s tuners loaded the car on an open trailer and headed down to Summit Motorsports Park in Norwalk, Ohio, to log a few passes in advance of the NMRA World Finals. With not much more than the car and a tire gauge on the trailer, there wasn’t a lot tweaking done at the track. In the unseasonably warm weather—the high was 86—on September 17, Chuck Sr. ran three 8-second passes, the quickest being an 8.906 at 153.47 mph. Not looking to set the world on fire, Chuck Watson Sr. just wanted to make a couple of test hits in advance of the NMRA World Finals to see how the company’s street/strip 2015 would fare. Running it right off an open trailer, he piloted this street/strip SEMA car into the record books again, laying down the first 8-second pass in an S550 with an independent rear suspension. Not much has changed about the Watson S550 since its 9.13-second pass a few weeks ago save for a refined calibration in the F.A.S.T. PCM. 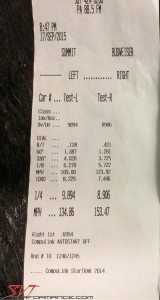 Incredibly, however, this 8.90 run was made with the full exhaust in place and drag radials out back. Chuck Sr. didn’t even open up the electric exhaust cutouts. With any luck, you’ve been following the progress of Watson Racing’s street/strip S550 right here on the SVTP Front Page. Built for the 2014 SEMA Show, this 2015 Mustang was constructed to run quick quarter-mile e.t.’s while retaining its street manners. The car’s upgrades include a Whipple supercharger, FAST EFI, lightweight windows, a bolt-in 9-inch IRS, and a 10-rib blower drive. Before dipping into the low 9s, the Watson team finally removed the car’s manual transmission in favor of a more consistent Turbo 400 automatic. Though the IRS out back is a robust, Watson Racing creation, this car is still the quickest 2015+ Mustang yet with an independent rear suspension. Certainly that record will be challenged this weekend in Bowling Green, but it’s possible the lower e.t.’s could come from this same car as it responds to the cooler air at Beech Bend. It definitely will be fun to watch. Watson Racing is rumored to participate in the first-ever NMRA Grudge Night, squaring off against BMR Suspension’s Kelly Aiken in the after-hours action. We’ll be on hand to see how it plays out, so stay tuned.